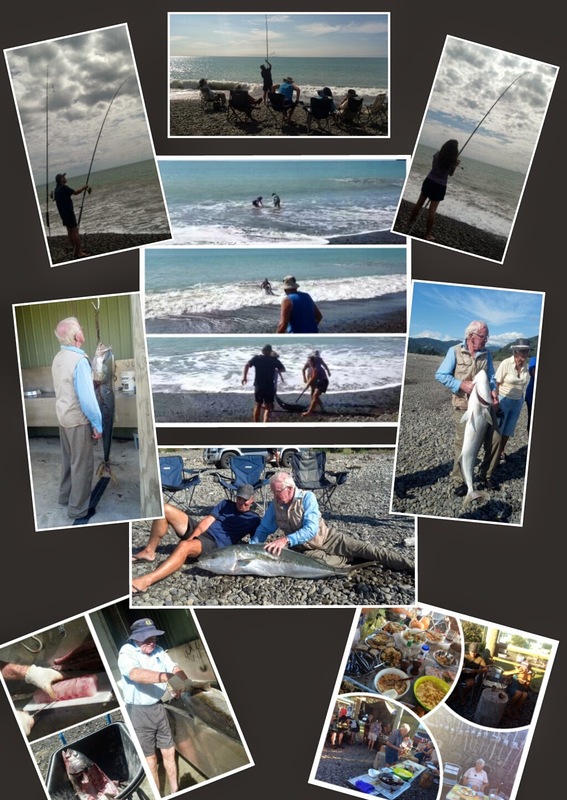 Did you here the one about the 25kg (55lb) king fish that didn't get away. Well as the story goes one scorching hot day in February, down by the beach at Maraenui, a wise old man Jack (80) baited his shiny new, very expensive graphite rod with a live kawahi and sent it out to sea to entice a biggie. Well no sooner had the livie hit the water than a biggie had taken the bait. Out to sea it tried to run but Jack was too wise for that. Calling over the young chap Mark (50) he handed him the rod and told him exactly what to do. "Keep watching the line and let him run but if the line goes slack reel him in," he advised. "It'll take a while but don't worry he'll eventually tire". So hold the line he did as the biggie swam up and down the beach from left to right and right to left again. Stopping only occasionally to rest his arms while the Mrs took the line. From 1 till 4 he toiled until eventually he had quiet an audience. Rumours of the biggie had caused quiet a stir. "Was it a shark maybe a sting ray," the doubters proclaimed. "No," exclaimed Jack, "only a king fish swims that way and my man Marks going to bring him in for me". We'll by 4:33 the crowds were getting restless and it was nearly time for 5'o'clock drinks. "That's it," Mark exclaimed, "no fish comes between me and my beer, It's time to reel him in." And reel him in he did, slowly at first but faster and faster he wound, as nearer and nearer the shore it came. With its green fin glinting in the sunlight, he took one last desperate run down the beach straight towards Jacks gaff. Ceasing the moment Jack took one almighty swing and struck him hard in the back. "Got you," Jack exclaimed triumphantly. But it wasn't over yet! As Jack battled the current his feet began to give way and the gaff started to slip from his hands. Then a giant wave knocked him head first under the water. Realising this was his opportunity to escape the fish gave one last swish of its tail and slipped out of the Mrs hands. "Grab the gaff, just grab the gaff," Jack demanded and quickly she did. Feeling the surge of the current she forcefully stopped the beast in its tracks. Jack swiftly jumped to his feet securely grabbing the fishes tail once and for all. Running down to meet them the spectators eventually came to give their support and helped heave the beast to shore. "Well what a beauty that is," Jack proclaimed, "just in time for 5'O'clock drinks." And 5'O'clock drinks were well enjoyed by everyone on that day, the next and the day after that. Fresh then smoked and devoured by all that big kingie was.